Here we come with a new SSC exams material PDF to get marks easily in exams. 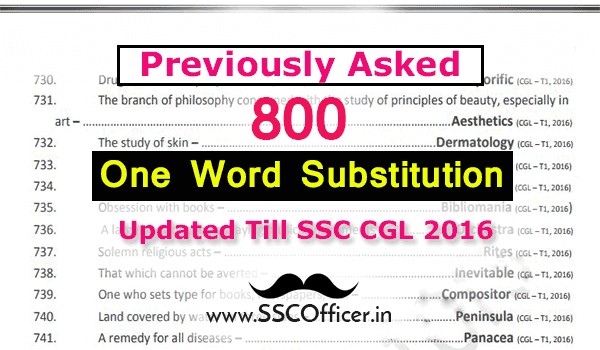 Previous Year 800 One Word Substitutions are compiled in one PDF updated till SSC CGLE Tier-1 2016.The PDF is free and easy to download by just clicking on below link. The previous year questions are included in this PDF and solved by the expert team so can get good solution and tricks. Here we come with a new SSC exams material PDF to get marks easily in exams. SSC English Chapter-wise Solved Papers is the important book for SSC Exams and you can easily learn from this book. 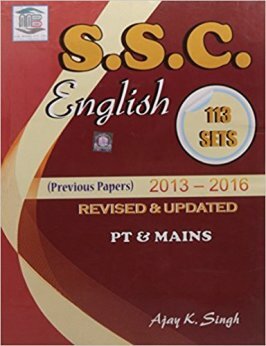 Now we have posted a PDF of SSC English Solved Papers from 2013 to 2016.The PDF is free and easy to download by just clicking on below link. The papers are in the chapter-wise arrangement so you individually learn many topics. The previous year papers are included in this book and solved by the expert team so can get good solution and tricks. Phrasal Verb is the important part of SSC English. So we are collecting the best material of English Phrasal Verb in a PDF. These are very easy to understand and learn in handwriting in English and Hindi medium both. 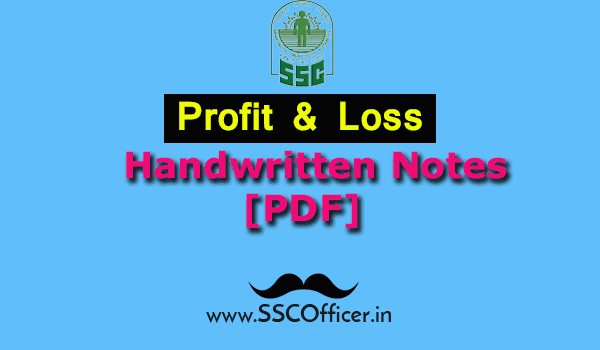 There are many other PDF for Free Download also there on SSC Officer's Website. Yon can download the PDF from below link and start learning them. Simple Interest is the important part of SSC Maths in various exams of SSC. SSC exams contain various questions from this topic so you have to start to learn simple interest from this post. Simple Interest Handwritten Notes can be download from below link. Handwritten notes are Hindi medium so you can easily and learn. These notes are collected from toppers and bind in a PDF to give you best material for SSC Exams. Hello Wanna Be Officers, Here we come with the SSC STENO (GRADE "C" & "D") official notification for 2017 Exam. The exam will be held from 04-09-2017 to 07-09-2017. This is the computer-based exam and this is the detail notification by SSC which can be download from below link. You can download a full image of SSC CGL official notification. Here we come with a new SSC exams material PDF to get marks easily in exams. Kiran's SSC Maths Chapter-wise solved papers is the important book for SSC Exams and you can easily learn from this book. 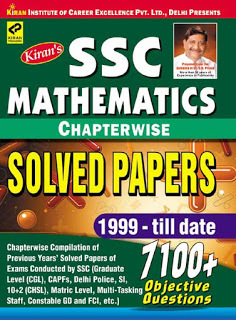 Now we have posted a PDF of Kiran's SSC Maths Solved Papers from 1999 to till now. The PDF is free and easily to download by just clicking on below link. The papers are in the chapter-wise arrangement so you individually learn many topics. The previous year papers are included in this book and solved by expert team so can get good solution and tricks. SSC has released a new notice regarding Result date of SSC JHT 2017 Tier-I and Exam date of SSC JHT 2017 Tier-II. Check the Official Notice at the end of the post. SSC Board has released a new notice regarding Exam date of SSC CHSL 2016 Tier-II and SSC JE Tier-II. The SSC CHSL Exam conducted on 09.07.2017 and SSC JE on 30.7.2017. Check the Official Notice at the end of the post. 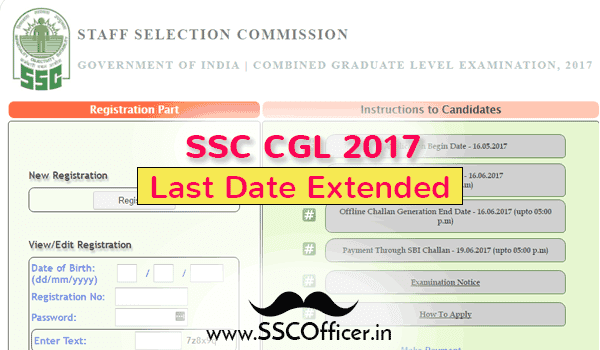 SSC Board has released a new notice extending the last application date of SSC CGL 2017 exam from 16-6-2017 to 29-6-2017. Check the Official Notice at the end of the post. 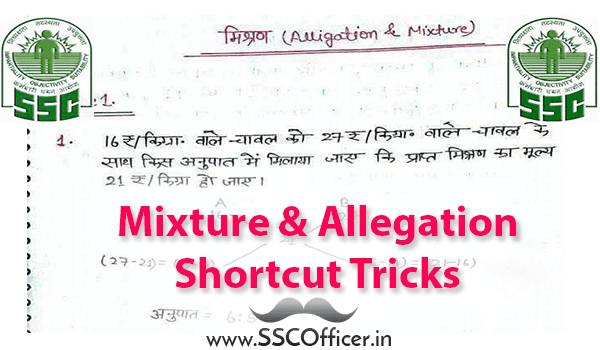 Mixture and Allegation are the important part of SSC Exams and it takes more time as compared to other topics. These two topics are combined in a PDF. You can free download the PDF from our site SSCOfficer's Download section. These notes are in Hindi and Handwritten so you can easily understand. Here we are come with a analysis of cut-off of SSC CHSL Exam from 2011 to 2016 result and based on this analysis we are also release the expected cut-off of SSC CHSL 2017. The analysis table is the PDF which can be download from below link. The expected cut-off of SSC CHSL depending on the previous year results. Take these cut-off very seriously and study hard to clear the exam. Download the PDF and Check Cut-off. 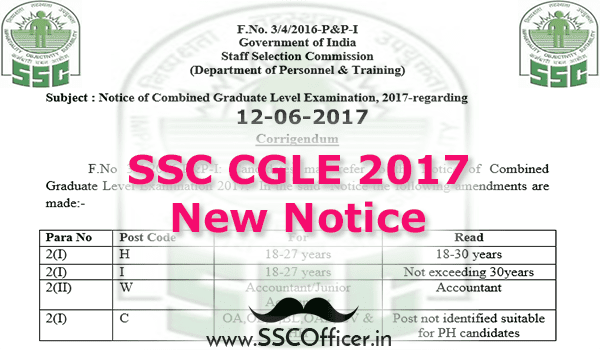 SSC release a new notification for SSC CGLE 2017 regarding change in some point of previous notification. You have to check this notice and fill the form according the new notice. The notice is mainly for the age change for some post. So now if you eligible for the post fill the form as soon as possible. Download the PDF and Check Notice. 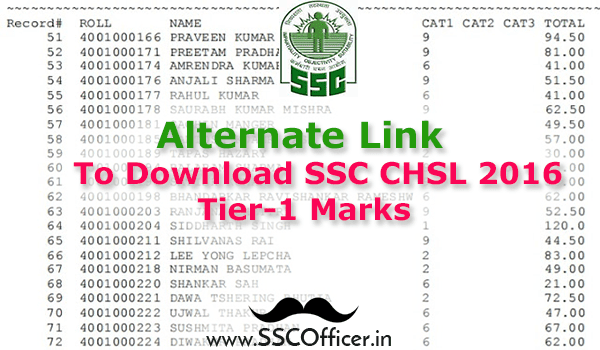 SSC CHSL Exam 2016 Tier-1 Marks has been declared by the SSC with the list of Roll Number's in PDF. You can download the PDF from below and check your result in the PDF by searching your roll number. Download the PDF and Check Your Result.